Octagon House, Green Street at Leavenworth. 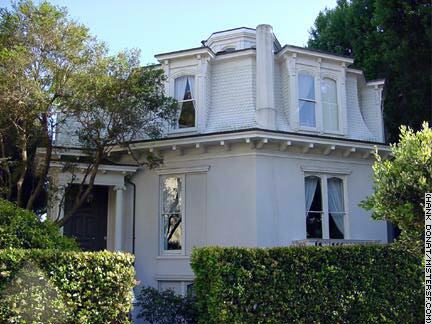 The Octagon House was built in 1861 across the street from where it stands today, 2645 Gough Street at Union. It was moved in 1952. The house was built by a doctor who believed the layout was conducive to good health because it allowed for so much exposure to sunlight. The Octagon House Museum is a showcase for Colonial furniture run by the National Society of Colonial Dames of America. On the upper floor is an incredible display of documents signed by 54 of the 56 signers of the Declaration of Independence. Only Button Gwinette of Georgia and Thomas Lynch of South Carolina are missing. There were once eight octagon houses in the City. The other remaining house, a private residence, is on Russian Hill, Green Street at Leavenworth. Part of the Gough Street property was given to the City and is now a secluded park with a beautiful lawn and lots of flowers. The park is accessible from Gough and Green streets. The museum has odd hours, so make a note. The Octagon House is open from noon to 3 p.m. on the second Sunday and the second and fourth Thursdays of every month except January. Closed holidays.